Akrapovič has launched a new range of exhaust systems for the Porsche 911 GT3 (991) that will further stimulate the senses and make one of Zuffenhausen’s all-time great cars even better. Using its experience gathered through an intensive racing program, Akrapovič has developed four new exhaust systems and a carbon-fibre rear diffuser for the GT3 that will appeal to all drivers and make the most of an already amazing car. The Slip-On Line represents the first step in the exhaust system tuning process, and the muffler can easily be installed. Crafted from hi-grade titanium and finished with two eye-catching round tailpipes, the EC/ECE type-approved and CARB-compliant Slip-On Line is an entry-level system that makes the GT3 more powerful and lighter, and gives the car that unique Akrapovič sound. The Sports Cup Line system is the next step in the exhaust tuning process. It’s crafted from top-quality titanium. 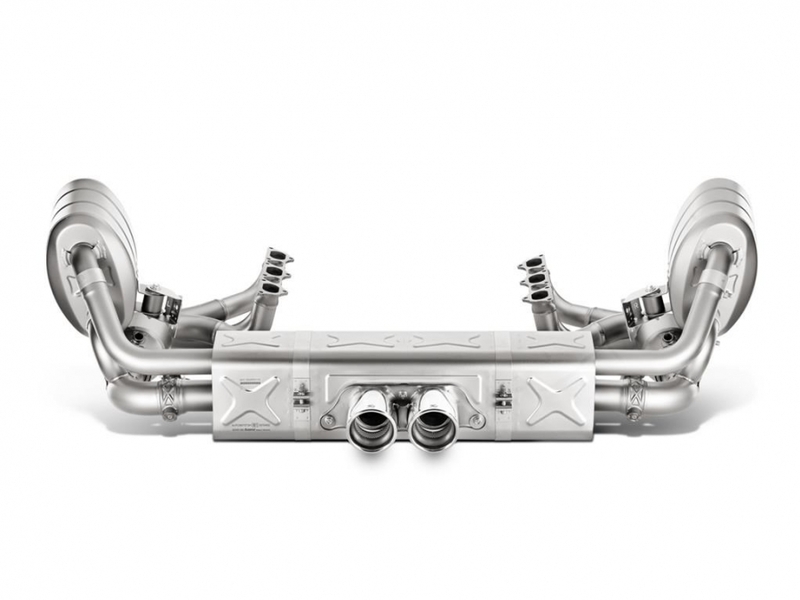 Designed to retain the original Porsche GT3 exhaust manifold with its integrated catalytic convertors, the Sports Cup Line has a perfectly balanced titanium end muffler and superbly fitting link pipes as a connecting piece to the manifold, all set off with a pair of beautiful titanium tailpipes. The Sports Cup Line is primarily intended for track use and increases power and torque levels accordingly (+19.6 HP at 3,900 rpm, 39 Nm / 28.8 lb-ft at 3,900 rpm)—especially through the all-important mid-range. The incredible 72% (−21 kg / −46.3 lb) reduction in weight in the area behind the engine and the rear axle (in comparison to the original system) means handling is improved to make the car and exhaust work in perfect harmony. 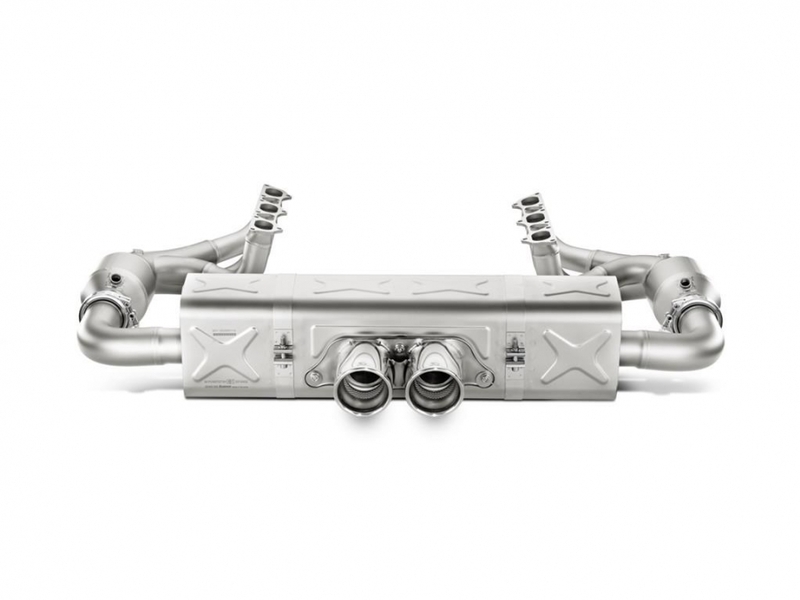 The titanium Evolution Line exhaust system offers an increase in power and torque outputs (+ 10 HP at 8,000 rpm, 27.3 Nm / 20.1 lb-ft at 3,850 rpm), as well as lowering the overall weight to improve handling. With its beautifully formed lines, the system is designed with superb attention to detail, including parts cast in Akrapovič’s own titanium foundry, and a coating for durability ensures that the whole exhaust is a joy to behold. Incorporating 100 cpsi sports catalytic convertors and side mufflers, all designed to increase power and torque, the Evolution Line utilizes integrated catalytic convertors and the functionality of the new exhaust valves to deliver an out-and-out attack on the senses. With the valves in the open position, the Evolution Line sounds like the top-performing Evolution Race system, but also has the option of a lower sound level when the valves are closed, perfect for use in more everyday locations. The Evolution Line has been tuned by Akrapovič’s in-house sound engineers to serve up a more sporty and hard-hitting roar, and in open valve mode the more the engine is revved, the better the sound gets—while increasing performance—all to provide an even greater sensory experience. The Evolution Race Line is a full system that’s beautifully crafted from hi-grade titanium and finished with a coating to resist discoloration and make it scratch-resistant and easy to clean. Built for the track, the Evolution Race Line has the performance to match (+19.9 HP at 3,950 rpm, 50.6 Nm / 37.3 lb-ft at 3,900 rpm). From the perfectly formed titanium headers with 100 cpsi sports catalytic convertors through the titanium flanges, cast in Akrapovič’s own foundry, and right on to the superbly finished round titanium tailpipes, Akrapovič’s new system is pure quality. Developed to deliver enhanced power as the revs rise, with a perfect power curve right from 3,000 rpm to the very top of the power band, plus increased torque and the maximum weight reduction to improve handling, the Evolution Race Line exhaust system will have the car performing like a true cup racer—with a deep, loud, and powerful Akrapovič racing sound to match. 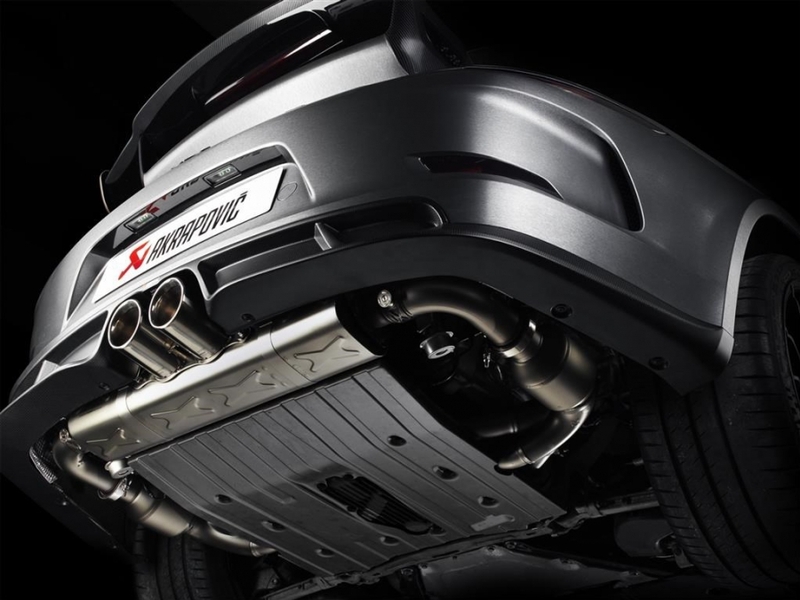 Designed to make the GT3 stand out from the crowd even more, the visual delight of Akrapovič exhaust systems can be further enhanced with the addition of an optional carbon fibre rear diffuser. It’s beautifully handcrafted from the finest materials and is designed to enhance the exclusive look of the titanium tailpipes. The ABE type-approved diffuser is a must-have extra for any discerning owner and shows that the GT3 means business, even when it’s standing still. The full range of Akrapovič systems will make the Porsche GT3 faster, more powerful, and even more responsive, to make a truly great car even better, delivering an assault on all the senses to make driving an Akrapovič-equipped GT3 a fully emotional and exciting experience.